In an effort to support the research and educational needs of its users, the library holds the vision that it will always seek to provide the required resources. The mission of the Portmore Community College Learning Resource Centre (LRC) is to support the curricular goals of the college. By acquiring, organizing and providing quality resources, the centre intends to enhance the learning experience of its clients, in an effort to inform, enrich and empower users to become lifelong learners and productive citizens in a dynamic and global society. 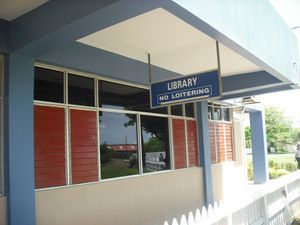 The College Library known as the Joyce Robinson Learning resource Centre is a shared facility. Both the Portmore Community College and the Portmore HEART College of Construction Services are located on the same Compound and share the facilitiy. The College opened in February 1992 and within that same year a small library was established in one of the classrooms. Students who volunteered their services operated the library. 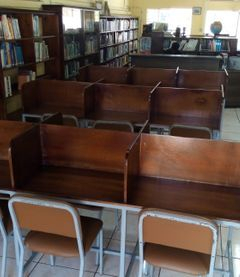 However, following discussions between the Executive Director of HEART/NTA and the President of the Council of Community Colleges of Jamaica (CCCJ), a decision was taken to merge both collections into the Academy’s library. The merge of the two libraries and increase in the college’s population resulted in increased demands on the limited facilities and so in 1993 a task force was set up to advice on its expansion. The College opened its first satellite campus in Old Harbour on the former premises of the OLD Harbour Primary School, at 41East Street in October 2001. In the same year a small room was designated for a library. The library was further developed in 2008 with financial assistance from the CHASE Funds.